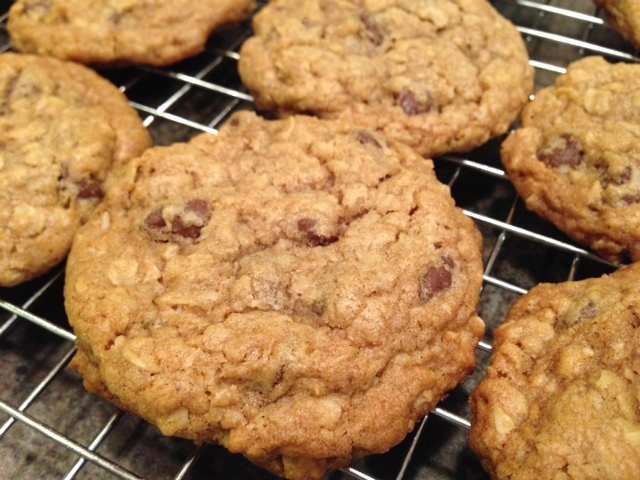 I had a hankering for a good oatmeal cookie, so I hit the Internet trying to find one that would do the trick and that’s when I stumbled upon this recipe on Betty Crocker’s website. Unlike many oatmeal recipes that use one cup of oatmeal, this recipe calls for two cups of oatmeal, so I gave it a try and the whole family enjoyed them. Heat oven to 350°F. In large bowl, stir brown sugar and butter until blended. Stir in vanilla and egg until light and fluffy. Stir in oats, flour, baking soda and salt; stir in chocolate chips and nuts.